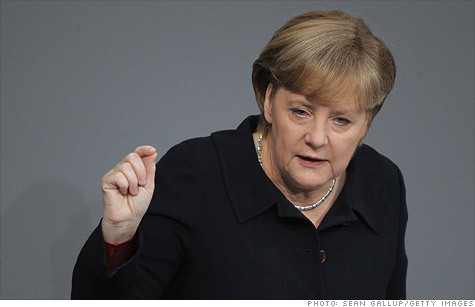 German Chancellor Angela Merkel affirmed her call for a fiscal union to help resolve Europe's debt crisis. BERLIN (CNN) -- German Chancellor Angela Merkel reaffirmed her commitment to a fiscal union Friday, saying 'there is no other way' to resolve the deepening European debt crisis. But it will still take a long time before Europe is truly out of the woods. "The European debt crisis won't be over within a drum beat," she said, during a speech to Germany's Bundestag, the country's national parliament. "We are working for treaty change, we want to avoid a split between euro and non-euro countries." The idea of some type of fiscal union has been gaining traction this week. On Monday, European Council president Herman Van Rompuy said that European leaders were working on a new plan that would ensure fiscal discipline across the euro area. More details are expected on Dec. 9, when EU government heads meet in Brussels. European leaders have come under fire for not acting quickly enough to address the debt crisis, which has threatened to unravel the eurozone. Merkel described it as a "crisis of trust," saying "politics has failed." Germany is the largest and strongest economy in Europe. But a disappointing German bond auction last week raised concerns about how deep the contagion might spread, particularly since German bonds are considered the gold standard of stability. But this week's debt auctions have fared better, and on Friday, the yield on the German 10-year bond was trading at 2.19%. And the yield on the 10-year Italian bond backed even further away from the 7% danger zone, dropping to 6.54% Friday. Italian bonds have repeatedly crossed the 7% level over the past couple of weeks, raising fears that the eurozone's third-largest economy may be headed for a bailout. The 7% mark doesn't automatically trigger a bailout, but it does start to raise warning signs since it's the level crossed by Ireland, Portugal and Greece before those fiscally troubled nations were eventually bailed out by their neighbors. Leaders from the eurozone and other nations have been stepping up efforts to get the debt crisis under control. On Wednesday, the Federal Reserve, along with the ECB and the central banks of England, Japan, Switzerland and Canada, took joint action to make it cheaper for banks around the world to borrow U.S. dollars. The ECB will hold its next policymaking meeting Dec. 8, when it's widely expected to announce an interest rate cut. Marc Chandler, global strategist for Brown Brothers Harriman, said that greater coordination among eurozone leaders is essential, noting that so far, policy makers have taken "small, largely ineffective steps, which do little to garner market confidence." "We continue to believe that tighter fiscal coordination is a minimum requirement, together with a backstop for sovereign debt, be it the [International Monetary Fund,] the ECB or a combination of both," said Chandler, in a research note. Despite the long road ahead, Merkel remains optimistic. "The euro has proven to be successful. It is stable," she said. However, she rejected "quick fixes" such as the use of eurobonds. "I cannot imagine a common liability for the debts of others," Merkel said.